All your garments are hand finished. Our knowledgeable and experienced pressers provide careful finishing touches to all your clothes. 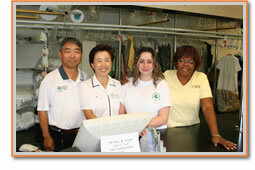 We customize our services to the special needs of your garments. Your items are handled according to their specific needs and restored to their original shape and appearance. Our pressers take care to ensure clothes are pressed to avoid a shiny finish. Our computerized inventory system ensures an accurate tracking of your garments, to avoid any lost or mixed up items. Palm Desert Cleaners. All Rights Reserved.